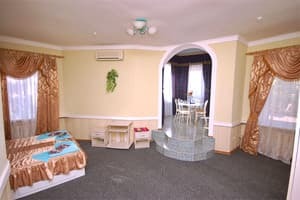 At Your disposal there is a comfortable Hotel in Alushta. 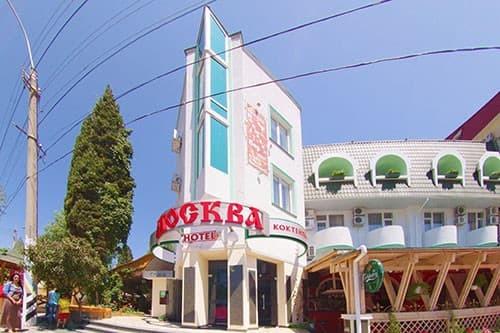 Private 3-storey hotel 'Moscow" is situated in 250 metres far from the Central quay and the sea.Our hotel in Alushta will hospitably open its doors for You and will make Your rest in Alushta pleasant ALL THE YEAR ROUND! On the ground floor of the hotel there is a reception, a restaurant, sauna, indoor heating swimming pool, gym apparatus. On the 2-3 floors of the hotel there are different categories of apartments at Your disposal: single one-room, double one-room, half-de luxe, two-room de luxe, and apartments on the on the first floor, apartments on the second floor, apartments on the third floor, which have modern interior, a telephone, colour TV sets, cable television, microclimate systems, fridges ( mini-bar is only in de luxe rooms and apartments). Most of the rooms have balconies. All 25 hotel rooms have individual design. There are beach towels in each room. You can iron Your things in the Utility room of the hotel. A safe ( is be paid for) is on reception. Housekeeping is made every day. Change of bed-clothes takes place once in three days. We offer laundry service. Description of the room: Single room with balcony, has one cozy room of 13 sq.m. Description of the room: Spacious single rooms, with a picturesque view outside the window. Cozy rooms with individual design. 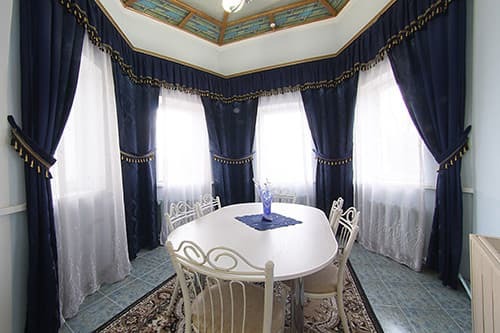 Description of the room: The room represents a cozy one-room with all conveniences. Description of the room: One-room double room in the original oriental style. 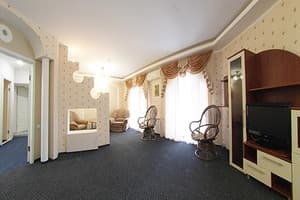 Description of the room: Suite of category "B" - two-room suite with balcony, 25 sq.m. This room offers stunning views. The room is equipped with modern furniture, air conditioning. In the room: a bed (double), a sofa (extra bed), a coffee table, a wall, a chest of drawers with a mirror. The room has beach towels. 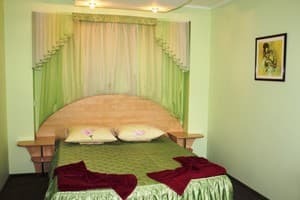 Description of the room: The cozy room is equipped with everything necessary for comfortable living. Description of the room: Suite "Classic" - a two-room cozy room equipped with modern furniture, air conditioning. The room has a balcony. Description of the room: In the room there is a double bed, a sofa, 2 armchairs, a fireplace. Description of the room: In the room: double bed, sofa, 2 armchairs, fireplace. Прекрасное расположение гостиницы: прямо рядом (метров 50) с разворотом троллейбуса на Симферополь. Набережная совсем рядом. Через дорогу продуктовый магазин. Очень отзывчивый и адекватный персонал. Разрешили оставить вещи после выселения. Сидели в номере с товарищем и бутылкой: персонал рисепшина толерантен и доброжелателен. Почему об этом пишу? Друг обитал через дорогу в санатории "Алуштинский". Там на входе на нас орали: "Вы куда?". Очень доволен ночлегом, поэтому останавливался дважды. В душе была снята решетка вентиляции. Зияла неопрятная дыра. Residence for children under the age of 7 without providing with an extra bed is free of charge. 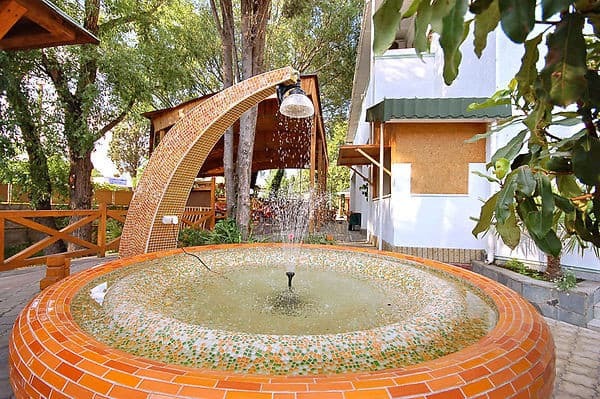 An extra bed costs 100-130 Uah. 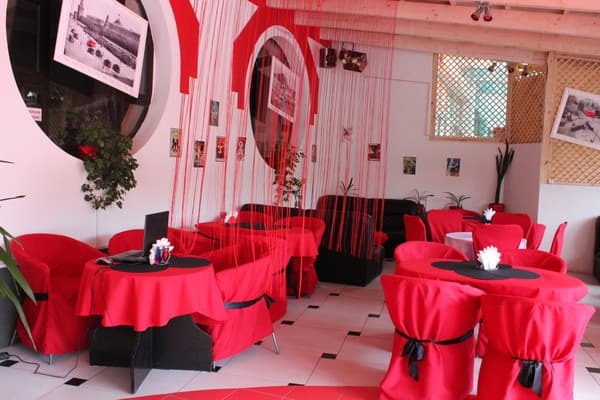 Hotel 'Moscow" is situated in 250 metres far from the Central quay and the sea. 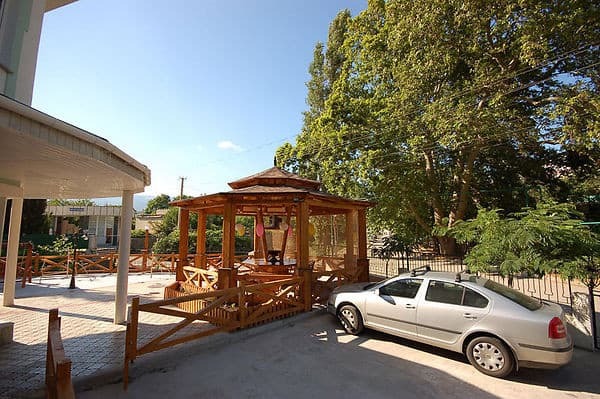 Alushta city, Horkoho Street, 8.